Musicworks magazine is proud to offer internship positions that kick-start careers for talented, ambitious magazine or not-for-profit professionals. The chosen candidates will be motivated, take great attention to detail, have a strong analytical ability, are adaptable to change, take initiative, are fluent in Microsoft Word and Excel, and demonstrate excellent written and oral communication skills. To apply, please submit a cover letter and resume (in PDF) outlining how your skills and experience make you the right fit for our organization. These internships provide valuable on-the-job learning for creative, detail-oriented, self-motivated individuals that wish to gain experience in magazine publishing, arts administration, and the not-for-profit sector. These unpaid positions cultivate skills in every aspect of the field—a distinct advantage afforded by a small, non-profit arts magazine like ours—and are perfect for ambitious post-secondary students or working individuals looking to gain skills and experience. Our interns are mentored and guided by Musicworks staff and are an integral part of our high-achieving team. From advertising and business administration to editing, circulation, marketing, outreach, and promotions, the opportunities for learning through our internships are vast. "The magazine industry is fast-paced and vibrant, offering its employees an opportunity to get involved and meet new people within the community to build relationships and knowledge of many different cultural markets. Working with Musicworks gave me the chance to attend experimental music festivals, gallery exhibitions, launch parties, as well as events in the city of Toronto that celebrate Canadian literature." My colleagues were welcoming, patient and understanding, always answering my questions and taking their time to explain any task to me in a professional and friendly manner to ensure my full understanding. The atmosphere is relaxed, professional and warm, making you genuinely happy to come to work each morning." Working as an intern for Musicworks has proved to be more exciting and rewarding than any other job I have encountered yet, I would encourage anyone with an interest in communications, fine arts or journalism to apply and be a part of this growing community of artists, literature and excitement." "My internship at Musicworks was not only a wonderful learning experience during which I gained many valuable skills, but also an incredibly enjoyable and pleasant time. It was challenging enough to push me into new and unexplored territory, however, I always felt supported and felt that I could always ask for further instruction. There wasn't a single time that I was made to feel like I was 'just an intern,' but rather, always felt that I was an equal part of the Musicworks team. I gained a wide range of skills -- from communication and research skills to analytical and problem solving skills, (which were gained while developing several exciting projects), to technical and computer skills (which the Musicworks team always taught with patience and enthusiasm). It was clear that the Musicworks team did not seek out an intern simply to fetch coffee and take out the trash, but rather to enrich, benefit and develop both the intern and Musicworks. 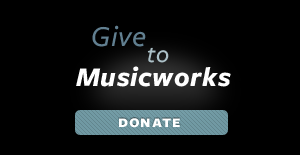 It goes without saying that there aren't enough good things to say about the Musicworks team. They were always energetic, supportive, and eager to teach, and the work environment was stimulating, supportive and always positive, but also challenging -- in the best possible way. And, most importantly, there was never (not once!) a shortage of caffeinated beverages in the office. My overall experience at Musicworks was tremendous and invaluable, and I'm incredibly grateful for having the opportunity to have worked here." "As a publishing student, working at Musicworks really helped me to learn about the different facets of how a magazine works. I was able to get hands on experience doing a wide variety of tasks that you can't quite get while interning at a larger magazine. I was able to solidify my proofreading and editing skills with real editorial material, I gained experience using social media and digital routes of publicity and marketing, and I was able to be a part of one of the most welcoming and encouraging work environments I have ever encountered." "My time with Musicworks was nothing short of phenomenal. The downtown office is a great location, made only better by the knowledgeable and friendly Musicworks team. They were able to guide and teach me to better use my organizational skills in real world applications. My writing skills were constantly improved under their tutelage, as well as my ability to make interpersonal connections. The Musicworks team is kind and patient, and I cannot overstate how much I value its time and teachings. I learned a great deal not only about the inner workings of a fascinating industry, but also learned about my own skills and potential. My stay with them was brief, but what I gained was so much more than I ever thought possible." Contact musicians, photographers, and other artists to source music scores, photographs, and audio files for use in Musicworks magazine and on our website. Contact musicians, photographers, and other artists to acquire permissions for use of materials. Open incoming recordings for potential review and categorize by genre and publication date. Work with Musicworks' copyeditor to input of copy changes. Design and implement contests to engage Musicworks readers. Collaborate on readership surveys and assist in the analysis of results. Assist in the development of promotional advertising in print and online. Participate in the creation of monthly e-newsletters to subscribers, advertisers, libraries, and participants in the Musicworks in the Classroom program; tracking and reporting on open-rates. Assist in the administration of the Musicworks Sonic Geography and Electronic Music Composition Contest. Assist with donor outreach and in fundraising activities to cultivate stewardship. Assist with tri-annual mailing of magazine.